There is a growing pool of research on court outcomes in sentencing Indigenous people but relatively little research on the information available to sentencing courts to consider Indigenous background. Although Australian courts mostly have discretion to consider Indigenous circumstances, such consideration depends on submissions and reports tendered in court. The High Court in Bugmy v The Queen (2013) stated “it is necessary to point to material tending to establish [the defendant’s deprived] background” if it is to be relevant in sentencing. The main repository of court information on defendant background is counsel submissions and, where the defendant is facing imprisonment, Community Corrections’ Presentence Reports. Based on 18 interviews with judicial officers, lawyers and court staff in New South Wales and Victoria, this article identifies the need for more information on relevant Indigenous background factors in sentencing. The introduction of discrete Indigenous community reports that present Indigenous perspectives on the person’s background and rehabilitation was regarded as important for addressing the Bugmy requirement. This article makes reference to the wide-scale experience in Canada of First Nations presentence reports, known as “Gladue Reports”, and the more small-scale Australian experiences of Indigenous cultural reports, to indicate how this material can enhance individualised justice in sentencing Indigenous peoples. It is important that the public has confidence in the judiciary so that it will abide by its decisions. However, there are many ways to undermine the public confidence in the judiciary. A relatively new method of undermining the public confidence in the judiciary can occur when the public writes highly critical or malicious comments about the judiciary on social media. Such comments can spread on social media instantaneously to a huge number of people – this makes it unique in comparison to some of the other methods of undermining confidence in the judiciary. This article examines how the government and business deal with critical or malicious comments on social media and applies this to the judiciary. It argues that it is important that the judiciary take preventive action in this area so that they are in the best position to deal with critical or malicious comments on social media when they are posted. In all Australian jurisdictions, many serious offences can be tried summarily, and in most jurisdictions, an indictable offence can be tried by a judge without a jury. In Alqudsi v The Queen, the High Court majority held that trial by judge for an offence against Commonwealth counterterrorist legislation would be inconsistent with s 80 of the Constitution. This article examines the reasoning of the decision and compares the different State provisions which currently enable serious offences including murder and sexual offences to be tried by a judge only. Given the pervasive effect of news streaming, the internet and social media, it is argued that there are compelling public policy issues which commend an accused being able to elect to waive his or her right to trial by jury and instead be tried by a judge who is more likely to be immune to the effects of pre-trial publicity and whose reasoning can be subject to critical analysis. Lawyer mediators who are accredited under Australia’s National Mediator Accreditation System (NMAS) are obliged to comply with the rules of conduct of the legal profession and other components of the “law of lawyering”, as well as with the Practice Standards issued in connection with the NMAS. This article amalgamates the two regulatory systems to which lawyer mediators are subject to identify and analyse the ethical duties owed by lawyer mediators. In addition, it aims to suggest ways in which to improve the NMAS Practice Standards, which have become, arguably, the single most important regulatory instrument for mediators in Australia. 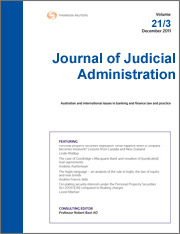 For the PDF version of the table of contents, click here: JJA Vol 26 No 3 Contents.